Personal growth is the increase of truth, beauty, and goodness. To increase in these things we have to chase them in whatever ways we find interesting and compelling. One way I personally seek growth is through exploring website design, writing, and imagery. I’m drawn to design because it’s fundamentally language and language is self-expression, and self-expression is a result of clarity and clarity is a result of—ta-da—personal growth. Because of my practice in the language of design, I've gained a bit of knowledge and skill in these areas and occasionally I take on an outside project. Working with me is a paradoxical experience of very relaxed collaboration and intense production. In everything I do I tend to obsess on One Thing until it's finished, so you'll find me available, active, and rapidly iterating your design project during our time together. There's also a relatively quick turnaround time. On the other hand, I'm a pretty zen, flexible, casual, and undemanding person. I know what it feels like to know what I want... and NOT to know. Design takes patience and sometimes trial and error with fonts, colors, images, and tone. My philosophy is to make haste... slowly. If you're looking for an easy, relaxed, casual, experience that increases the beauty and goodness in your life and doesn't require you to have a lot of knowledge, this could be for you. Below is more information about what I offer. Do you already have a website, but spend too much time trying to find images that both fit your brand, and go with each other? The struggle is real. I've spent years creating my own process for curating, editing, and managing photos for my brand and others. I regularly create collections of high resolution, free-to-use images on Unsplash. If you explore these free collections you may find what you're looking for right now. 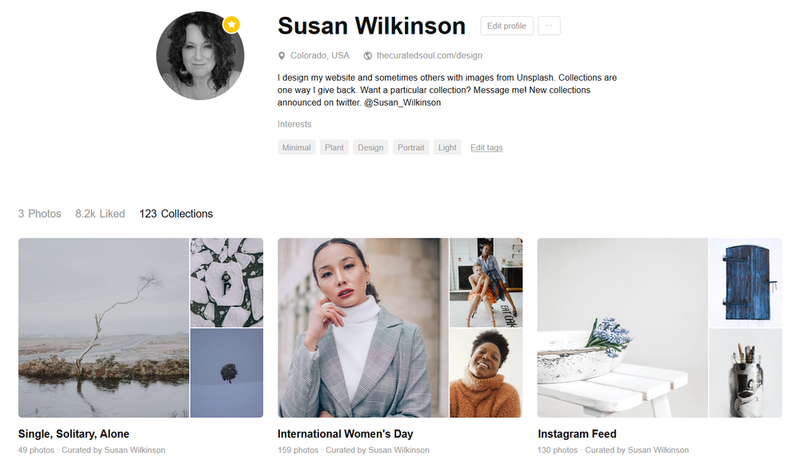 If not, for a reasonable fee (depending on your needs), I can curate a private collection just for you, specific to your brand, from the hundreds of thousands of images available on Unsplash. The quality of images found here are far better than most stock photography, without the price or hassle. The Curated Soul is one example of a Squarespace website that I've customized. I design with Squarespace because it's low maintenance, secure, and has gorgeous templates. You can check those out here. This website was created from the Sonora template. Website design in both function and form isn't all you need for great representation. You also need to tell the right story, in the right way, to connect with those you're trying to reach. The pages of your website do the bulk of that storytelling work. The moment someone comes to your website or social media account they're first hit by a visual "vibe" from the images, layout, colors, fonts, and graphics. Their judgment of you and what you're about begins instantly. The writing either confirms or denies their impression. I can help with all of this by degrees from consultation for cohesiveness, to doing it for you if we're a good fit. The website above is an example of me taking the reins of a website and doing the writing. Working with me begins with you thinking, "I love her work, I want help, and I like the idea of making haste slowly in a productive but casual process. I think she could help me bring my vision to life." After that you either choose a design bundle or we talk and create a custom bundle just for your needs. I value flexibility for me and you, so I’m groovy with creating something for you ala carte if that helps. I price custom work on a case-by-case basis according to what you want. I like being flexible on terms of payment as well. I've even bartered at times. That said, let me give you a range. On the lower end (depending on level of difficulty) is $175-$225 for an image consultation and at least 25-40 (usually more) do-whatever-you-want-with-them-images curated for your brand onto a private image board. You will love them, they will fit your brand, and they will go together. Can you envision not having to worry about images for your website or blog? Oh! It's a huge relief. I testify. On the other end of the spectrum, for a more comprehensive project with website, branding, images, social media bios, and some copywriting it will be closer to $4000, more or less, depending on details. If you have a tight budget, we can discuss how you can get the most for your money. But Can You do this...? Of course there's always the question, but can you do X? Web design is a huge category! Q: Can you create my social media bios, blurbs, and images or write my author bio? A: Yep. Usually pretty quickly and easily. So if this is bothering you, offload it to someone who finds it fun and easy! Q: Can you create my logo, edit my logo, or create graphics or templates for social media? A: I don't create logos, but I can sometimes edit them. I can do some simpler graphic design and yes I can create social media templates to complement your brand. First, know this. If you're still here, we might be a good fit! But I know what it feels like to resist contacting someone. You see a beautiful website, feel like you really could connect with a service provider, and yet you can still be intimidated or concerned about contacting them. Sometimes it doesn't feel like intimidation or concern. It just feels like procrastination. If you feel intimidated, like you're not sure if your needs are reasonable or doable, try to relax and let me take that burden. If you can't get where you want to go from here, then I'll tell you why and try to point you in the right direction. I'm very clear about what I can and can't do, and I'll pass that clarity on to you. I LIKE helping those who think my knowledge and eye for design is magic. If that's you, then we are a match made in heaven. Let's chat! If you want to check out the Design Bundles first, here’s that link again. Please note these prices are good through Summer 2019 only. If you prefer a phone call, what's the best time to contact you? Generally, tell me what kind of help you need. Help with images might be just wonderful. I may, or do, want a website. I'd like to discuss copywriting for social media or other bio.